This is the introduction to the recent New York Times bestseller "What the Dog Knows: Scent, Science, and the Amazing Ways Dogs Perceive the World" by Cat Warren (Touchstone paperback, March 2015). The book - both a memoir of the author learning to train a cadaver dog, and an exploration of the fascinating world and science behind working dogs - was long listed for the 2014 PENN/E.O. Wilson Literary Science Writing award, as well as receiving the 2015 Merial Human-Animal Bond award. For more information, photos, videos, and reviews, visit catwarren.com. I've grown more comfortable working with the dead. With parts of them, really. A few teeth, a vertebra, a piece of carpet that lay underneath a body. 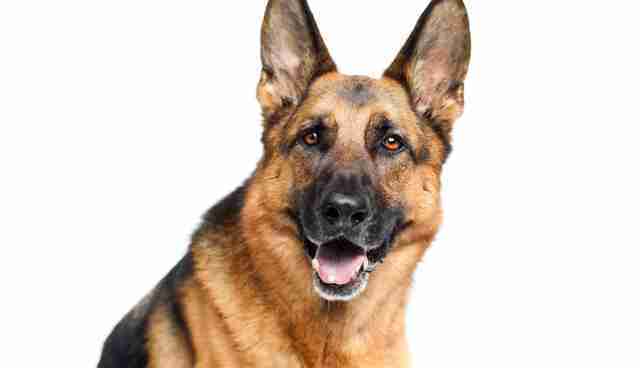 One of my German shepherd's standard training materials is dirt harvested from sites where decomposing bodies rested. Crack open a Mason jar filled with that dirt, and all I smell is North Carolina woods - musky darkness with a hint of mildewed alder leaves. Solo smells the departed. Solo is a cadaver dog. I occasionally get a call asking for our services when someone is missing and most likely dead. People have asked me if Solo gets depressed when he finds someone dead. No. Solo's work - and his fun - begins with someone's ending. Nothing makes him happier than a romp in a swamp looking for someone who has been missing for a while. For him, human death is a big game. To win, all he has to do is smell it, get as close as he can to it, tell me about it, and then get his reward: playing tug-of-war with a rope toy. I never thought death could have an upside. I certainly never expected a dog to point that out to me. Since I started training and working with Solo eight years ago, he's opened a new world to me. Sure, some of it is dark, but gradations of light filter through so much of it that I find it illuminates other spaces in my life. Solo and I have different reasons for doing this work. What appears to motivate him is not just the tug-toy reward at the end (although that pleases him greatly) but also the work itself, as he sweeps a field like a hyperactive Zamboni on ice, tracking will o' the wisps of scent down to their source. What motivates me is watching Solo, a black-and-red shepherd with a big grin and a huge rudder of a tail. He captures the hidden world his nose knows and translates that arcane knowledge for us humans. As one of the K9 unit sergeants said, admiring Solo's clear body language, "You can read that dog like a book." An easy book, happily, for a working-dog beginner like me. More Dr. Seuss's "One Fish Two Fish" than James Joyce's "Finnegans Wake." It's a good thing that Solo's approach is Seuss-like, because the larger landscape of the missing and dead sometimes keeps me up at night pondering, poking at small details, trying to understand an unknowable plot. 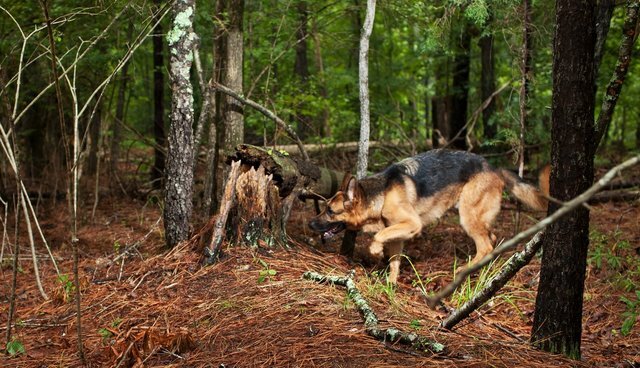 As one famous cadaver-dog trainer said, "Search is the classic mystery." My hobby can raise eyebrows. While close friends and a few of my university colleagues embraced the idea with delight, others cringed. With some colleagues, I knew better than to mention it. Mostly, they don't know, as there's no reason to. One administrator, surprised when I told him I had to miss an upcoming faculty meeting to take Solo on a last-minute homicide search, came back to me the next day. Perhaps, he suggested with laudable optimism, I could put cadaver-dog work on my curriculum vitae as extension and outreach? I am not sure this peculiar avocation burnishes my academic credentials. I appreciated his willingness to consider it, though. I know cadaver dogs are an esoteric branch off the working-dog tree, as well as an acquired taste. If someone turns up her nose, I change the subject to politics. Academics, of course, don't have a monopoly on passing judgment. During a moment of calm at searches, sometimes a sheriff deputy or police officer will ask about what I do for a living. When I tell them I teach at a university, some wince as well, eyeing me for signs of effeteness - and weakness. Then, temporarily at least, we forget about our differences and continue the search, where we are on common ground. Solo has no idea that I have a split life, or that he's partly the cause of it. Why should he? He's a dog. He's unaware that human death and decay cause disgust or ambivalence. For him, death is a tug toy. For me, Solo is the ideal intermediary between me and death. When we search - but even when we train - he becomes the center of my universe, narrowing my scope to the area we're searching. My job is to guide him when needed but let him do his job independent of me, to make sure he has plenty of water and isn't too close to traffic or a backyard Rottweiler, and to watch him closely the entire time, as he tests the air currents and reacts to them. Looking for a body is an idiosyncratic way of walking in the woods. If I come across a snapping turtle or see an indigo bunting flash in the trees, or if the winter woods open onto an abandoned tobacco barn surrounded with golden beech trees, the pleasure remains, though the reason for being there is a somber one. And it's not all beauty out there: The hidden barbed-wire fences, the catbrier and poison ivy, the deadfall, clear cuts, and garbage dumps that litter the woods all demand my attention, and they get it. Though Solo doesn't love pushing through briar, other than that, even in junkyards or abandoned homesteads, he enjoys sticking his nose into the dark hollows and spaces created by piles of rusted-out heaps and old foundations. I worry more about copperheads, jagged metal, and broken glass than I do about the dangers posed by people, even when a case involves homicide. I do know more about the drug trade in North Carolina than I did before, and I avoid certain truck stops along the I-40 corridor, even if the fuel gauge is near empty. Overall, the world seems less frightening with a large dog at your side - and that is perhaps especially true when one faces death. For thousands of years, and in numerous religions, from Hinduism in India to the Mayan religions in Mesoamerica, the dead have depended on the continued assistance of canines to help guide them wherever they are going. The Zoroastrians wanted a dog present at funerals, though not just any dog. Preferably a "four-eyed" dog, with a spot of darker fur above each eye. I imagine an ancient shepherd version of Solo doing a gleeful slalom through the mourners. Tragedy, occasional incompetence, and inevitable cruelty are part of the work, a given. I don't forget those facets: They are relevant, but they don't shine, and not just because Solo is present. Savvy police and sheriff investigators, experienced search managers, locals who know every dirt road and creek in the county, and families and communities that care - because most do - end up occupying much of my selective memory space. Working with this one ebullient German shepherd and his good nose was the beginning of an odyssey that has started to merge worlds I've loved separately for decades: nature, researching and writing about biology and applied science, and working and playing with animals - especially dogs. The dog's nose has led me to environmental biologists, forensic anthropologists, cognitive psychologists, medical examiners, and military researchers. I've been able to interview, meet, and apprentice with talented working-dog trainers and handlers - people I've ended up liking as much as I like dogs. I've trained alongside canine handlers and trainers who work with drug, bomb, and patrol dogs. In that world of law enforcement, dogs are not just good friends but irreplaceable extensions, lending noses and ears and sometimes bodies and teeth to their human partners, smelling and hearing things their human handlers cannot, going places most people are reluctant to go. My epiphany was not that working dogs are miraculous - by themselves, they aren't - but instead, how inextricably linked their success is to the quality of their handlers, and the trainers who train the handlers. Working dogs' success is far from a given: It takes imagination, deep knowledge, and constant work to train and handle dogs who work with their noses for a living. These are the dog people whose lives and careers are so interwoven with working canines that it can be difficult to see where the person ends and the dog begins; they complete each other. Not because the work they do is smooth or easy. The opposite is true. Often they are working in dangerous environments, or in the midst of devastation - whether from crime, war, climate change, earthquakes, or airplane crashes. The rare perfection of that human and canine partnership in our weird, complex, mechanized world is what keeps working dogs from obsolescence. Working dogs are a holdover from simpler times. Sometimes they're seen as a sentimental and unnecessary indulgence. Not all dog-and-handler teams are effective. But when they are good, they are very, very good: They can distinguish scent, cover territory, and accomplish tasks that no machine is capable of. We have new needs for the old work of dogs. I don't handle and train dogs full-time. I probably will always be a serious hobbyist. Despite the nightmares I have when I make errors, I still return. I'm hooked. As I get better at juggling university demands and training demands, and as I learn to deal with the inevitable sadness, what remains is the intense physical and mental challenge of stripping a search to its essential elements so the dog can do his best work. Walking in the woods with Solo, as scent starts to loft in the morning warmth, I can concentrate so fiercely on our surroundings that time slows and warps. Or I can simply enjoy a night of training as the fireflies come out and Solo waltzes through solving a complex scent problem, a dancing figure in the dark. He is a dog who both lives and narrates as his brown eyes snap with pleasure and impatience and he comes bounding across a cow pasture to lead me back to what he has discovered two hundred feet away. Hey, come here, will you? Quick. The dead stuff is over here. Let me show you.